The International Journal of Gynecological Cancer (IJGC) is the primary educational and informational publication for topics relevant to detection, prevention, diagnosis, and treatment of gynecologic malignancies. Its content is read by gynecologists, medical oncologists, radiation oncologists, radiologists, pathologists, and research scientists with a special interest in gynecological oncology. IJGC emphasizes a multidisciplinary approach and includes original research, reviews, and video articles. 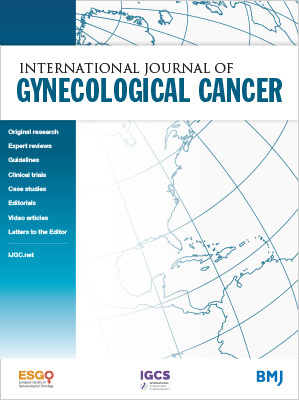 IJGC is the official journal of the International Gynecologic Cancer Society and the European Society of Gynaecological Oncology. Our next session of the IJGC Twitter Journal Club (#IJGCclub) will be held on Monday, May 13th at 5:30 PM CET (11:30 AM EST). Be sure to join us! Guest Editors Michael Frumovitz, MD, and Alessandro Buda, MD, are pleased to announce a special issue of the International Journal of Gynecological Cancer focusing on sentinel lymph nodes in gynecologic cancers. Physicians and researchers who are engaged in the study of this topic are invited to submit an abstract for review to ijgc@jjeditorial.com by Wednesday, May 15th, 2019. Abstracts will be reviewed and investigators of those abstracts chosen will then be invited to submit full manuscripts for peer review. Learn more here. The International Journal of Gynecological Cancer accepts submissions of original research and reviews. The Author Information section provides specific article requirements to help you turn your research into an article suitable for IJGC.